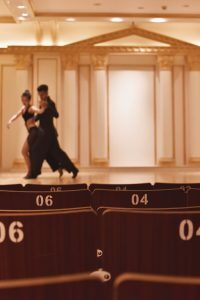 If you’ve never been to a ballroom dance class before, it can be hard to know how to prepare for it. Of all the things you’ve had to consider before your first lesson, knowing what to wear may have left you with some blanks. Let’s discuss some of the basics of ballroom dance class attire to see what the best choice for you may be! One of the first things that will determine what you will wear to your class will be whether you are a male or a female. When it comes to male attire, what is typically worn can be labeled as “business casual” style. This means that in the colder months, what would constitute dress shirts and dress pants. When the weather begins to get warmer, dress shorts are also acceptable for ballroom dancing. What you’ll want to avoid with your outfit is anything that could restrict your movement and cause you to dance poorly, or even rip your clothes by accident! Similar styling is recommended for females as well. Loose-fitting skirts, dresses, or pants will work best for dancing in ballroom class. For tops, pretty much anything is alright so long as it does not prove to be a distraction when dancing. Some garments to avoid wearing to your first ballroom dance class are short skirts, tight pants, spaghetti strap tops, and strapless tops. These garments all tend to be distracting while dancing and can impede your performance on the dance floor. As for shoes, this is where you have to consider how seriously you are willing to take ballroom dancing. If you see yourself attending dance class regularly, you should consider investing in a nice pair of ballroom dance shoes. If this is a one-time hobby that you don’t see yourself being involved with in the future, suede or leather soled shoes work just fine for the dance class you attend. Whatever shoe you do choose, just be sure that it will securely stay on your feet. Shoes that are too loose will not only negatively impact your dance performance, they could even lead to a sprained ankle. Spare you and your partner the trouble and try before you buy! Regarding accessories, the less you have on the better for your first ballroom dance class. Short and simple are your best bets. Jewelry such as long necklaces, chunky rings, or dangly earrings put you at risk for accidentally clipping your partner, so it’s best to leave them off during your lesson. The same applies to male wrist watches, which tend to be bulky in size. 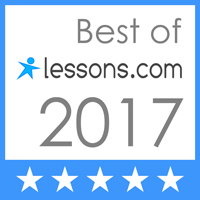 When it comes to your first ballroom dance class, think flowy, simple, and minimalistic. It is also pretty common to work up a sweat during class, so it can never hurt to bring along spare set of clothes and a towel for after your class. So be prepared, and don’t forget to have fun at your first ballroom dance class!